November 8, 2016 (San Diego’s East County) – The Heartland Foundation, publishers of East County Magazine, an award-winning community publication, recently served as a media partner of the 2016 Kids Care Fest, which featured free health care screenings for children on Nov. 5 at the Lakeside Rodeo Grounds. November 3, 2016 (Lakeside)--The Grossmont Healthcare District (GHD), a public agency that supports health-related community programs and services in San Diego’s East County, will present the 2016 Kids Care Fest, a free, family-oriented health event open to the public. Featuring free health care screenings, Kids Care Fest will be held from 9 a.m. to 1 p.m., Saturday, Nov. 5 at the Lakeside Rodeo Grounds,12584 Mapleview St., Lakeside. Now in its 15th year, Kids Care Fest is an opportunity for children to receive free, potentially life-saving health care screenings, including vision and dental screenings and children’s wellness checkups. The event will also feature information from dermatologists, pharmacists and other medical professionals, along with free kids fingerprinting and free flu shots (while supplies last). Oct. 24, 2016 (San Diego’s East County) – The Heartland Foundation, publishers of East County Magazine, an award-winning community publication, has been named a media partner of the 2016 Kids Care Fest, a free, family-oriented event open to the public. Featuring free health care screenings, Kids Care Fest will be held from 9 a.m. to 1 p.m., Saturday, Nov. 5 at the Lakeside Rodeo Grounds,12584 Mapleview St., Lakeside. September 17, 2014 (San Diego’s East County) – This week’s Destination East County has some hot musical and theater events, also marking the start of Hispanic Heritage Month celebrations. Plus we’ll have previews of coming attractions, from a Fiesta in Spring Valley to the Viejas Days Parade. 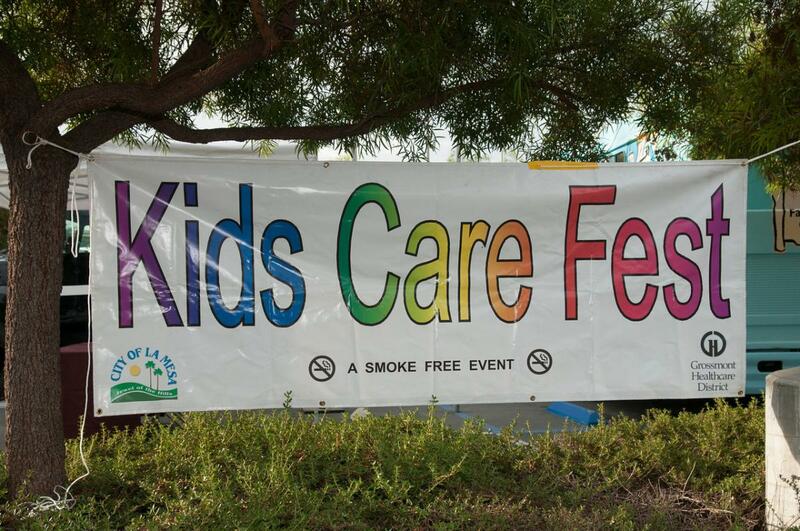 September 9, 2014 (La Mesa)--The date has been announced for the 2014 Kids Care Fest, a free, family-oriented event open to the public featuring free health care screenings. This year’s Kids Care Fest will be held on Saturday, Sept. 20 at Briercrest Park, 9001 Wakarusa St., La Mesa. The event runs from 9 a.m. to 2 p.m.
Now in its 13th year, Kids Care Fest is presented by the Grossmont Healthcare District, La Mesa Park & Recreation Foundation and the City of La Mesa. Organizers expect more than 1,000 children will receive free, potentially life-saving, health care screenings, including hearing, vision and dental screenings, from healthcare professionals. Grossmont Healthcare District and the City of La Mesa will present Kids Care Fest from 9 a.m. to 2 p.m. on Saturday, Sept. 22 at Briercrest Park, 9001 Wakarusa St., La Mesa. Kids Care Fest is a free, family-oriented event featuring free health care screenings open to the public. Over 1,000 children under age 12 are expected to receive free, potentially life-saving health care screenings including hearing, vision and dental from healthcare professionals at 50 exhibit booths. Free medical information from pediatricians, dermatologists and pharmacists will also be available, as well as flu shots. More free hands-on activities will include arts and crafts, water safety, astro jumps and pony rides, demonstrations and displays from police and fire officials--plus giveaways and more. September 4, 2011 (La Mesa) -- The Grossmont Healthcare District and the City of La Mesa have jointly announced that Saturday, Sept. 24 will be the date for the 2011 Kids Care Fest, a free family event featuring free health care screenings at Briercrest Park, 9001 Wakarusa St., La Mesa. The event will be held from 9 a.m. to 2 p.m. on that day. It will be the 10th annual Kids Care Fest event. The public is invited to attend. September 13, 2010 (La Mesa) -- Grossmont Healthcare District and the City of La Mesa are jointly presenting the ninth annual Kids Care Fest, a free event featuring free health care screenings as well as children's activities, from 9 a.m. to 2 p.m. on Saturday, Sept. 25, at Briercrest Park, 9001 Wakarusa St., La Mesa. The public is invited to attend.